Agar agar can be considered either an exciting, novel molecular gastronomy ingredient or agar agar could be considered an absolutely standard, staple ingredient. In Japan and east Asia where it has been used for 400 years then it is more normal than its western counterpart Gelatine, indeed the word Agar Agar is simply the Malaysian word for jelly! If you have ever been to that part of the world and wondered why the jelly and ice cream is not exactly how you expected it, that is because you're eating agar and not gelatine. Vegetarians are probably familiar with gelatine because in many recipes then you can simply substitute vegetarian agar for the meat-based gelatine (remembering to use only 30% of the amount of gelling agent). Agar agar can be considered either an exciting, novel molecular gastronomy ingredient or agar agar could be considered an absolutely standard, staple ingredient. In Japan and east Asia where it has been used for 400 years then it is more normal than its western counterpart Gelatine, indeed the word Agar Agar is simply the Malaysian word for jelly! If you have ever been to that part of the world and wondered why the jelly and ice cream is not exactly how you expected it, that is because you're eating agar and not gelatine. Vegetarians are probably familiar with gelatine because in many recipes then you can simply substitute vegetarian agar for the meat-based gelatine (remembering to use only 30% of the amount of gelling agent). Where does Agar Agar come from? Agar agar is derived from plant cells and is a component of the cell walls in red seaweeds and algae. The story of the first use of isolated agar is that once upon a time then an old man was eating a bowl of seaweed soup at a tavern. He threw the contents of his bowl out through the window in a rage of seaweed hate. The seaweed stop from his bowl went through a freeze/thaw cycle on the pavement over the next few days and nights. Each freezing and thawing served to rupture the cell membranes of the seaweed and release more of the agar agar. The initial concentration of agar agar in a seaweed extract would be only about 2-1%, but if it is frozen slowly then large ice crystals will grow and squeeze liquid water our from the agar. Over a few cycles this can remove 90% of the water giving a 15% concentration of agar agar. Another effect of the melting is that it will carry away soluble impurities and salt just like when the Ganges rises and the flood waters carry away detritus from the river banks. 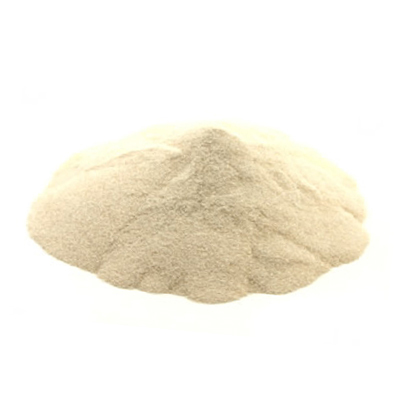 The resulting agar is a white powder, (although it can also be bought in sheets very similar to the way gelatine can). Dispese and mix well (blender and whisk) before attempting to heat and hydrate. It must boil for 3 minutes if it is to form a gel on cooling, (if you have heat sensitive ingredients eg. Vodka Jelly Shots then boil the agar agar separately and then add to the heat-sensitive components. 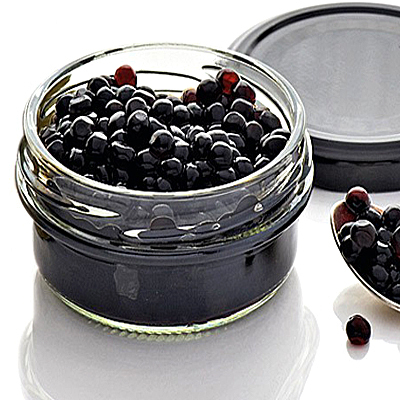 Add any inhibitive ingredients acids (for balsamic pearls) or alcohol (for vodka jelly shots) after the three minute hydrating boil. The setting of agar agar is reversible so you can always reheat and add either more hydrate agar or more liquid if the initial results are either too hard or soft. Foams: if you have a whipped cream charger and dispenser set then you can make a heat stable foam/espuma. Firstly make an agar jelly, using anything form 0.3% (for a light foam) to 2.3% (for a tight, dense foam). Once the gel has set then attack it with a blender to create a “liquid gel” then pour this into the whipped cream dispenser and charge with one or two cream chargers (depending upon volumes). The beauty of this is that you can serve hot foams, so stand the dispenser in some warm (>80°C) water for a while serving and then pump your foaming horseradish direly onto your steak. Jelly: you can pretty much get away with turning any liquid into a gel with agar agar, it is much more forgiving than traditional gelatine to salt, acid, alcohol. The texture can be anything from soft to crunchy, so play around with concentrations until you get something that you like. Adding a smidge of gelatine or locust bean gum to the mixture before it cools will give you a texture closer to regular gelatine based jelly. Replace 10% of the agar with locust gum or 50% with gelatine. Thickening: You can't simply use agar as a thickening agent because it will want to turn solid, but what you can do is blend an agar jelly to make millions of mini-jellies that have the effect of working as a thickener. Agar is very effective at selling up when absorbing water, so has been used as a novel diet – simply be eating the powder and allowing it to expand in your stomach you can fool yourself into thinking that you're full. 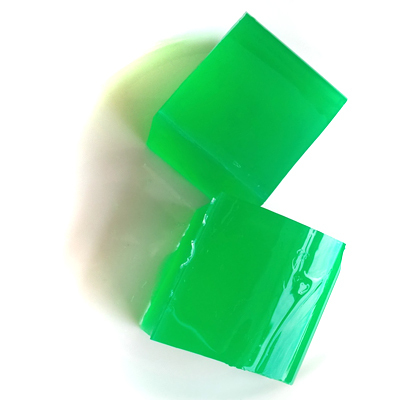 Agar Agar is 90% indigestible fibre and is an effective laxative when used in high doses. 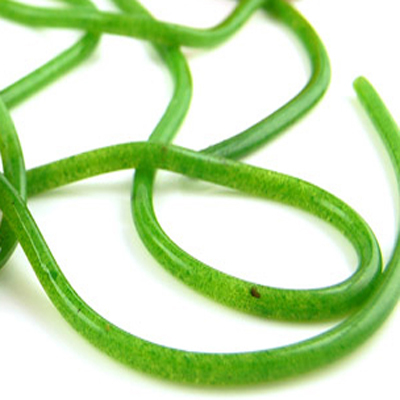 See the cheeky monkey recipe section for uses of this molecular gastronomy ingredient. Some of the simplest recipes and techniques and those that are fun for molecular children use agar agar. Start with the fruit juice spaghetti or the balsamic vinegar pearls. 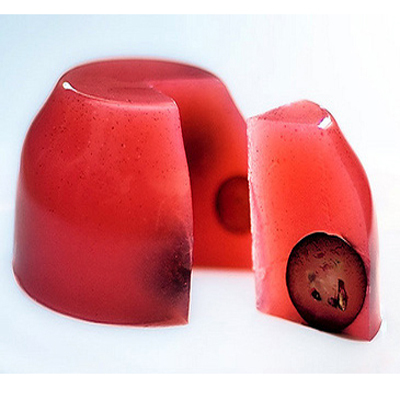 For the grown-up molecular mixologists then agar agar holds its shape in molecular margaritas or vodka jelly shots much better than gelatine so you can carve out some jelly shapes with nice, crisp edges and lines.